Its origin was from ancient China. Considered an instrument of magic by many, it was used primarily for Feng Shui purposes. Taken to the West it introduced open-sea navigation. Sailing vessels no longer needed to hug the coast. 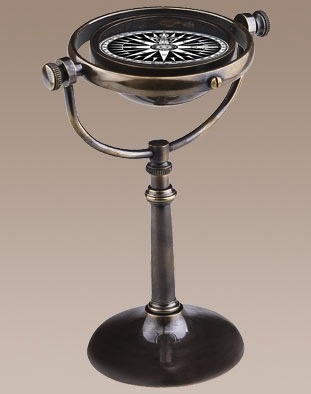 This ‘Collector’s’ compass was originally created for the scientific instrument collection of King George IV. Its elegant design features gimbal-rings, which serve to keep the compass bowl horizontal, regardless of how much the vessel is heeling over. Hand-tooled in admiralty brass.